Speaking in tongues, slain in the spirit, the second blessing - all terms familiar to a continuing and growing movement in Christianity that some call a 4th major section of the Christian landscape. Fr. Barnabas is a former pentecostal pastor and knows this community well. Also joining Fr. 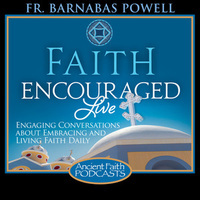 Barnabas for a section of the program is Fr. Andrew Stephen Damick, author of the current and soon expanded book Orthodoxy and Heterodoxy.